We're back with our second installment in our joint project with Alyson from Kidlit Frenzy, Mary Ann from Great Kid Books, and Travis from 100 Scope Notes. 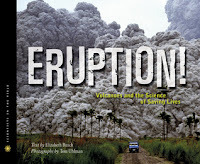 This time we're looking at the topic of volcanoes, and we've identified a range of nonfiction texts for young readers. 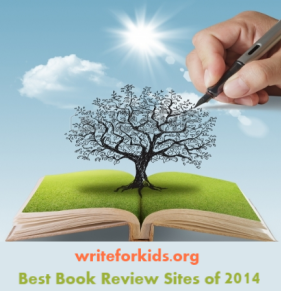 Be sure to visit all of Common Core IRL blogs to learn about the different volcano books featured today. The readers at my school love learning about science and nature, and they are especially interested in natural disasters such as earthquakes and volcanoes. In August of 1883 a powerful, volcanic eruption rocked the island of Krakatau, Indonesia. The Krakatau Eruption pieces together why it was "one of the most violent eruptions in world history" triggering tsuanamis, dropping ash on 300,000 square miles, and affecting "climate patterns all over the world." This is definitely an event in history and science that will fascinate children. The Krakatau Eruption is part of the True Book series by Scholastic; readers are asked to answer two true/false questions at the beginning of the book as a way of accessing prior knowledge and engaging readers in the content. The book design is attractive for elementary age students. Text features such as bold print, maps, timelines, colorful photographs and captions will help young readers access the information. Peter Benoit employs both a chronological and cause/effect format to organize the information. Students will be interested to read how scientists have pieced together clues about why the eruption was so violent. Earthquakes occurred a few months before the volcano erupted. Witnesses also reported seeing "thick, black clouds of smoke" over the island. The Krakatau Ertuption delves deeper into the "hows" and "whys" than the typical survey-style nonfiction book. Teachers and librarians could read The Krakatau Eruption with elementary classes and ask students to identify causes/effects based on evidence from the text. Back matter includes links to web sites, videos, and lists of books that could be used to extend learning. Describe the overall structure (e.g., chronology, comparison, cause/effect, problem/solution) of events, ideas, concepts or information in a text or part of a text. The Day the World Exploded, adapted by Dwight Jon Zimmerman from Simon Winchester's adult book Krakatoa, chronicles the first rumblings to the final explosion of the volcano Krakatoa. The author uses a combination of straight narration interspersed with eyewitness accounts to give readers a ‘You are there’ feeling. The addition of illustrations, a combination of photos, engravings, and illustrations, helps break up the text, which can be choppy at times. This is a good source for information on events leading up to, and the results of, Krakatoa's eruption. Winchester also includes in the narration the after effects of the eruption. Thousands of people lost their lives from ash, lava, and tsunamis. As explained in Eruption by Elizabeth Rusch, the destruction and loss of lives on Krakatoa was the direct result of the lack understanding on how volcanoes erupted back in 1883. Another plus for older readers is the inclusion of how inventions, such as the telegraph and the founding of the news agency Reuters, helped the world, "see for the first time that a natural event occurring in one corner of the planet had effects that spread over the entire world. The world was now suddenly seen to be much more than an immense collection of unrelated peoples and isolated happenings." Teachers and librarians could read The Day the World Exploded to upper middle and high school students and compare how scientists track volcanic eruptions then, and now. Back matter includes a glossary, suggested volcano websites, suggested reading, and index. Don't miss the middle grade volcano book, Eruption! 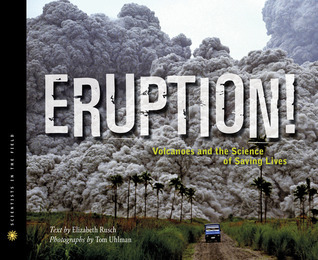 : Volcanoes and the Science of Saving Lives by Elizabeth Rusch (reviewed by Louise in July). Common Core State Standards that could be applied to Eruption! Analyze in detail how a key individual, event, or idea is introduced, illustrated, and elaborated in a text (e.g., through examples of anecdotes). My kids are intereste in volcanos so this is perfect! Thanks! Thanks for your detailed post! Volcano books fly off the library shelves at my school, so this post is definitely useful. I've also heard lots of good things about Elizabeth Rusch's newest volcano book Volcano Rising (http://www.charlesbridge.com/productdetails.cfm?PC=5777).